This is our guide to the upholstery steam cleaner and will explain why you should choose steam upholstery cleaners over other methods of cleaning. We will also look at how to steam clean upholstery and suggest some of our highest ranking steam machines. When thinking about steam cleaning we usually think about steaming carpets but a steam cleaner cleans upholstery just like it does carpets; the steam deeply penetrates through the layers of foam, fiber and fabric. Since most carpet cleaners are great upholstery cleaners we will not be doing a carpet and upholstery steam cleaner comparison. The difference from cleaning carpets is that you will want to look at portable steam cleaner upholstery machines. Cleaning your upholstery is necessary especially if you want the fabric to last, keep your home (or car) clean and are dealing with pet or children’s messes. A little bit of caring with a upholstery steam cleaner goes a long way and is definitely worth the effort. There are many places where we have to take care of upholstery; in our cars, furniture, draperies and even window dressings. Furniture steam cleaning should be done regularly as dust and dirt tends to settle on your furniture which can cause damage over time if not cleaned. 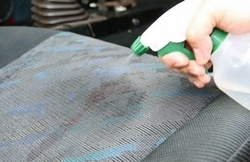 Why use steam upholstery cleaners? The answer is very simple; steam is extremely versatile and will clean basically any kind of surface. A upholstery steam cleaner will help you to not only get rid of tough stains and deep clean but will also sanitize your upholstery because steam will kill 99% of bacteria and germs very effectively. Your first step should definitely be to use a vacuum cleaner to regularly clean the accumulated dust off of your furniture. Many vacuums come with a crevice tool or upholstery nozzle which you can use to clean all the nooks and crannies in your couch. However, do note that vacuuming isn’t completely effective when cleaning and that the dirt may even go deeper into your couch. You can use an furniture steam cleaner to steam clean furniture. This effectively cleans all those embedded stains and dirt out of your couch and automobile interior. To get rid of a stain, use 3% hydrogen peroxide. Simply dab some of it onto the stain until the stain disappears. Another method to clean that stubborn stain is to use soda water and white vinegar. This works especially well and can also be used on carpet stains. Use whipped detergent or shampoo cleaner on your upholstery. Simply scrub and rinse. However, I am personally not a fan of this method as some cleaning solution dries and remains embedded in your furniture. Visit our Cleaning Solutions page for more detailed information on other cleaning solutions you can use. The above methods are fast and offer an adequate enough surface clean whereas a steam upholstery cleaner can offer a much deeper and more thorough cleaning. One precaution to take before deciding to steam any upholstered item is to check the material and manufacturers cleaning instructions. If this is not clear, do a test using the fabric steamer on a small obscure part of your couch. If there are no ill effects, then it is safe to steam clean. So how do you go about using an upholstery steam cleaner on your furniture? 1. Remove scatter cushions or any other objects around the couch or area. You will also want to quickly vacuum to get rid of any surface dirt and dust. 2. Identify the stains and use a stain treatment on them. Clean the stains first by using a good stain remover. 3. Get your steam cleaner ready by filling it with water. Allow it to heat properly until the steam ready indicator light turns on. 4. Once it is ready, methodically and slowly run the steam cleaner along the couch in a straight line. Then, according to the steam cleaner you’re using, run the vacuum attachment slowly along the same line to suction out the dirty water. 5. Repeat this, one section at a time until the entire piece of furniture is cleaned. Make sure to vacuum out as much water as possible. 6. After, use fans to completely dry your furniture. I’m a big fan of the McCulloch steam machines and my first recommendation is therefore the McCulloch MC1275. 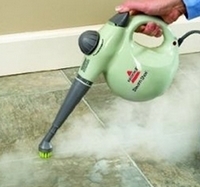 At around $126 it is great value for money as it is a multi purpose heavy duty steam cleaner of exceptional quality. The Bissell Steam Shot Hard-Surface Cleaner, a handy handheld steamer cleaner is perfect for cleaning upholstery as it has an upholstery attachment as well as a corner attachment and an upholstery brush. Although it only steams for 20 minutes on a tank it only takes a minute to re-heat after refilling it with water and you can get back to steam cleaning in very little time. Although the Bissell SpotBot ProHeat isn’t strictly a steam cleaner it is great for cleaning upholstery and carpets. It is lightweight and easy to carry around. The power cord is 22 ft long and the hose is 5 ft long ensuring that you will be able to reach usually difficult to reach areas with ease. The water tank is large and can be removed for easy refilling and cleaning. The suction power is very impressive and it will do a very good job at suctioning the dirt away and cutting the drying time dramatically down. The Bissell PowerSteamer PowerBrush 1623 is a full sized carpet cleaner (not a steamer) that is excellent at cleaning upholstery. If you are looking for a carpet cleaner that does very well with upholstery cleaning this is the machine to pick. 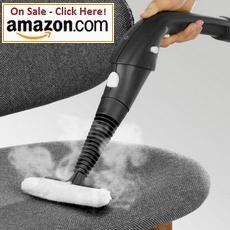 What about commercial upholstery steam cleaners? The Reliable Brio 250CC Steam Cleaner is a Vapor Steamer that emits dry steam that is even hotter than regular steam ensuring that upholstery will dry much faster. It is a multi purpose steam cleaner and will provide a professional deep clean for those of us who is serious about sanitation. Read more about Vapor Steam cleaners here. 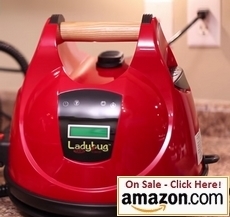 The ladybug is a real powerhouse and is a dry vapor steamer. Its’ steam is hotter than regular steam ensuring true sanitation. You can’t go cleaner than this! It is a continuous fill machine meaning that you can just keep on filling it with water as you steam saving a lot of time. This cute looking machine is the best of the best and although it is not cheap it is worth it. Cleaning Grout and how you can use a grout steam cleaner to quickly get rid of dirt and stains. Grout maintenance may seem like a hassle but with our reviews and tips it will surely make your life and grout cleaning much easier. Professional Steam Cleaner: A Look At The Pro Steam Cleaner Professional steam cleaner reviews vs. the home steam cleaner. Why investing in a professional steam cleaners is a better bang for you buck in the long run. 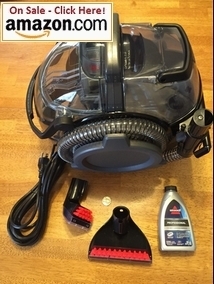 Steam Cleaner Parts & Steam Cleaner Accessories A guide to finding steam cleaner parts including: Hoover, Bissell, Scunci, Mcculloch and other accessories. Jenny Steam Cleaners: A Review Of Steam Jenny Cleaners A review of Jenny steam cleaners and their long history of excellence. The Jenny steam cleaner has come a long way and is still a great choice up to this day. Small Steam Cleaner: Mini Steam Cleaner Reviews These miniature steam cleaners are popular for people constantly on the move or simply want to quickly clean spills and messes. These machines may be small and cute, but they are completely functional.